A leading human rights expert has called for a change in hate laws after the Crown Prosecution Service (CPS) decided not to bring charges over alleged hate crimes against a Morden-based religious group. Lord Eric Avebury, vice-chairman of the Government’s Parliamentary Human Rights Group, also called for an investigation into why the CPS had only brought one case against incitement to religious hatred since the law came into being four years ago. In October, the Wimbledon Guardian exclusively revealed evidence of hate speeches, leaflets, and boycotts against members of the Ahmadiyya community, an Islamic minority sect. Evidence included video footage from a conference at the Tooting Islamic Centre (TIC), in which scholars called for a boycott of Ahmadi-run businesses and urged attendees not to associate with Ahmadis. Last month, the Crown prosecutor for Wandsworth, Hilary Ryan, said the allegations fell short of being criminally actionable. 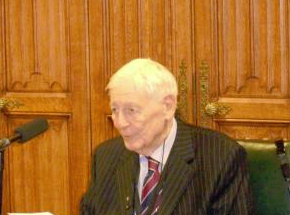 Lord Avebury, an 82-year-old Liberal Democrat peer, said the threshold for prosecution was too high. He said: “I believe the law on incitement to religious hatred has not been effective, partly because the prosecution has to prove not only that the accused did incite, but that he intended to do so. “At any rate, there has been only one case brought since the law was enacted, over a four-year period when incitement was becoming more prevalent. A CPS spokesman said: “A CPS London prosecutor gave initial advice that the material submitted could not constitute an offence. “If the police ask for a full review of the material, the file will be passed to the central casework divisions. A spokesman for the Ahmadiyya Muslim Association (AMA), which is based at the Bait-ul-Futuh mosque in London Road, said it was seeking independent legal advice before thinking about pursing a judicial review of the claims. Tooting’s MP Sadiq Khan has arranged for a meeting between senior memebrs of the AMA and TIC on Monday, December 13.. Copyright 2001-2010 Wimbledon Guardian, UK. All rights reserved.